Traditional prints of two famous Korean painters from the Chosun Dynasty are now available; Shin Sa-im-dang (1512-1559) a renowned female painter of the Chosun Dynasty, Shin Sa-im-dang is one of the most famous artists in Korean history and is known for her depictions of plants and animals such as 'Poppy' shown at left. We also have ten prints by Kim Hong-do (1745-1815? ), arguably the most famous Korean painter. his depictions of scenes of daily life from the Chosun Dynasty are renowned for their artistic value as well as the light they shed on the daily lives of citizens of the time. The Chosun Dynasty saw the decline of the influence of the strong Buddhist culture and the emergence of the Silhak, or practical learning, movement which emphasized understanding based on actual observance and thus ushered in works of realistically depicting plants and animals such as those by Shin Sa-im-dang, and genre paintings, or scenes of ordinary people engaged in common activities such as those portrayed by Kim Hong-do. All our traditional prints are mounted on a white matte frame. See our all our traditional prints here, and all our new items here. In addition to plants and genre paintings, many other types of paintings flourished during the Chosun Dynasty. Paintings from the Chosun Dysnasty can be roughly divided into five different styles; landscape, genre, minhwa, four gracious plants, and portraits. We currently have representative scroll paintings from most of those styles for sale including three genre scrolls, such as 'Boy on Ox' at right, two minhwa tiger scrolls, four styles of the four gracious plant scrolls, and two additional calligraphy scrolls. Learn more about the different styles of Korean painting in our article below "About Korean Paintings". See all our sale items here. or all our paintings here. We love art and like to show it on our company t-shirts; consequently they have become so popular we are now offering them free until the end of August and just in time for summer. 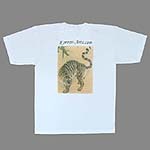 We are giving a free t-shirt ($15 value) for every order of $100 or more (total cost including shipping) from August 10 through August 31 2008 (Korea time). To get your t-shirt simply fill out the t-shirt ordering form that will appear after you submit your order of over $100. See details here. The back features a Tiger and Bamboo painting from the late Chosun Dynasty by Kim Hongdo (1745-1815?) and Im Huji (b. 1763) and the front has the "I ART" logo. Tigers play an important role in Korean art and history and symbolize a guardian and charm, and their likenesses, either on a painting on the wall, or on the back of your t-shirt, are thought to act as guardians to the owner. And they look really cool too! Our shirts are made from 30 thread count, heavy weight, 100% cotton, and like all our arts, are made in Korea. See our T-shirts here. 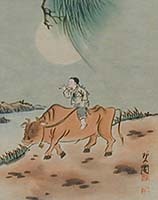 The history of Korean painting stretches back to the early murals painted on the walls of tombs during the fourth century, and continues to the present, in which a great number of Korean artists keep the styles and forms of the traditional artists alive, blend the traditional styles with modern motifs, or paint in a completely modern style. Just as today, painters from many countries study abroad to learn the styles of other countries master's or their traditions, so did the early Korean painters travel abroad to study the works of those that were considered the masters. In the fourth century, China was considered, both by itself, as well as by many Asian countries under its influence, to be the center of the universe. As such, many Korean painters were sent to China to learn modern Chinese painting styles. What they learned, influenced not only the paintings of Korea, but also the art of Japan, as many Korean artisans migrated to Japan. The Three Kingdoms period in Korea consisted of the separate kingdoms of Shilla (37 B.C. - 668), which absorbed the other two kingdoms and became Unified Shilla by 668, the Paekje Kingdom, which began in 18 B.C. and lasted until it was absorbed by the Unified Shilla Kingdom in 663, and the Koguryo kingdom which lasted from 37 B.C. until its unification with Shilla in 668. Each of the three kingdoms had its own unique painting style, each of which was influenced by a geographical region in China with which that kingdom had relations... read more here.